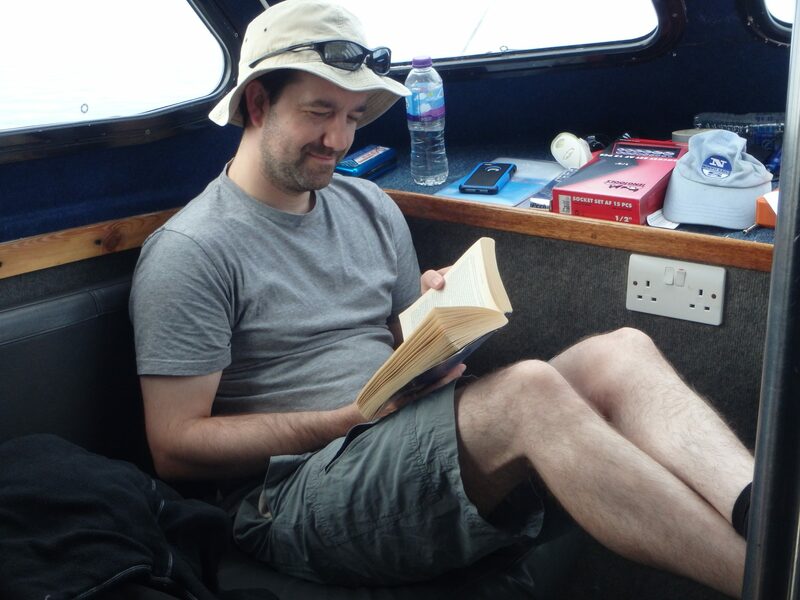 7th – 8th July 2018, Club trip to Sound of Mull, By Nic Faulks. 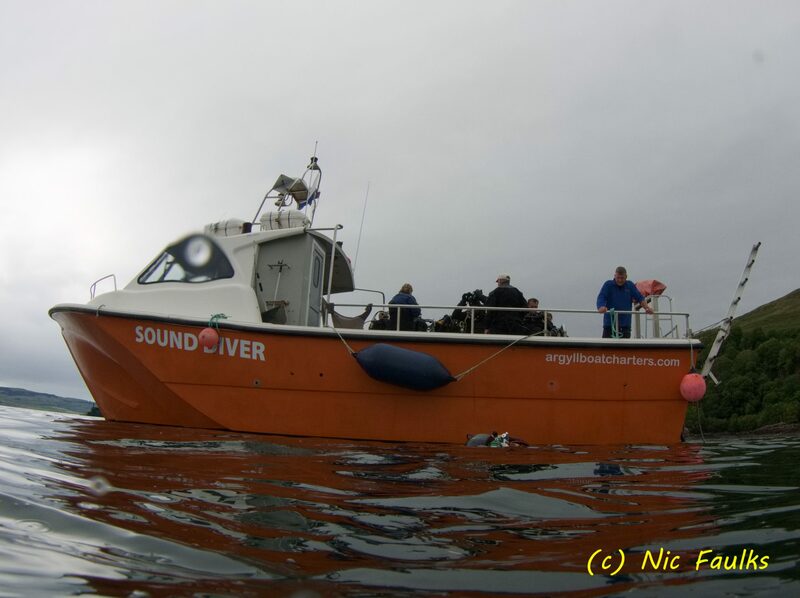 Our first weekend diving the sound of Mull this year and the weather was looking gorgeous. But would it last? Si and I arrived mid afternoon, to do the food shopping, then have a nice beer, in the sun shine. it was idyllic…. The Corran House Hostel/hotel, where we were staying, has some lovely views and some outside seating with an adjacent bar. Here we waited until everyone had arrived. Saturday dawned, wet, grey and drizzly. Typical, the rest of the UK is in a heat wave and we end up in the coldest place on the island. Ah well, hopefully the diving would be good. We boarded the boat at Dunstaffnage Marina, which is only a 5 minute drive north of Oban, with free and convenient parking. The boat we were on was Sound diver, skippered by Lorne MacKechnie, a very experienced and friendly skipper, with his son to help out too. After loading up, we all headed into the Sound of Mull, with the Hispania as the first dive. it took awhile for slack to arrive, but when it did we all descended the shot line and on to this beautiful wreck, totally covered with marine life. Although the visibility wasn’t brilliant (probably 7 metres) it didn’t really matter. Si and I spent a lot of time in the holds, exploring, seeing if we could internally swim the length of the wreck – which was possible. On exiting we realised why everyone else had left the wreck… the tide had turned and started to build up again, but being inside the wreck we hadn’t felt it! Back on the boat, we discussed our options and decided on the Shuna. A bit siltier and darker than the Hispania, this wreck is still quite interesting, especially its huge propeller which is still in situ. The sides of this wreck are covered with peacock worms, in their long tubes. If you can creep up on them, the feather heads look beautiful, with a whole range of colours. But create a current and pop, they all disappear back into their tubes. 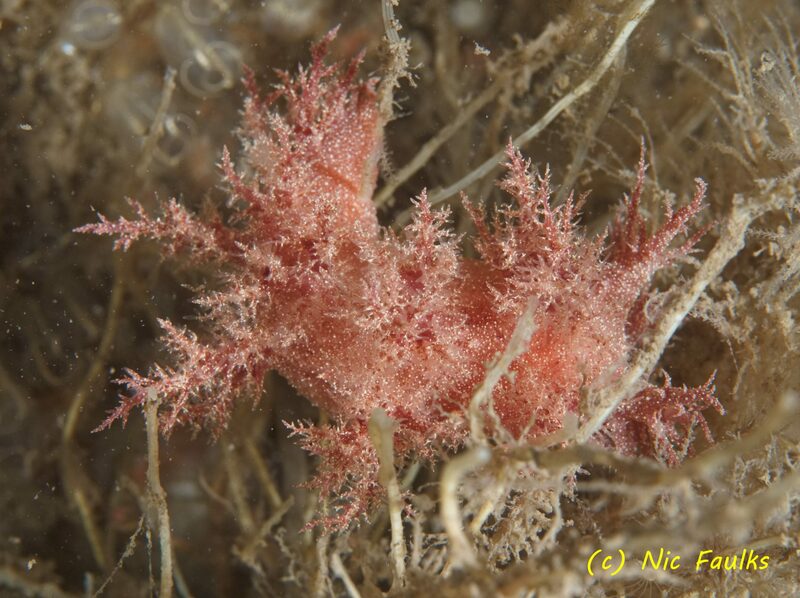 My find of the weekend was on this wreck, a nudibranch called Okenia elegans. beautiful white, yellow and a bit of red. 🙂 In general though, this is adarker more silty dive, but with a torch there is a wealth of life to see. Back on the surface, we had a bit of a drive back in to Oban. On the way we moved our dinner time to 8pm to give us more time to change and get ready. We all met up at the Cuan Mor for dinner. It was really nice food and all served with out too much delay. A bit hot as the place was full, but for the food it was worth it. After dinner, some of us went for a walk along the seafront, just to aid the digestion. We all met back at the hotel, where an in depth discussion about rebreathers ensued…. summary, it is an emotive issue and each type has its merits and down sides. Like cars, we all chose different ones for different reasons! Niall just chilling between dives. Sunday, easy start today as the kit had been left on the boat overnight. Only a moderate amount of rain…. First dive was the thesis, a wreck which is covered with life, showing that at some states of the tide, this wreck is subject to strong currents. It has collapsed a fair bit in the last few years, so you don’t tend now to be able to swim into it, but around is good, especially with so many nudibranches to spot. 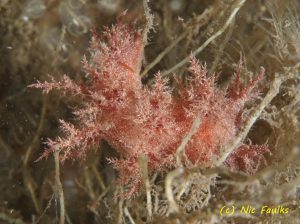 The amount of “Christmas tree” sea-slugs was amazing, in two colours – gold and red or white and brown. Under some of the wreckage we also found a rather large and grumpy looking conger eel. A nice dive, if you are into squidgy things! The final dive was the Breda, as this is closer to Oban, and a dive that some of our group hadn’t done before. This dive can be a bit like the Shuna, with more silt and a bit darker due to the mixing of the peaty fresh water and the seawater. 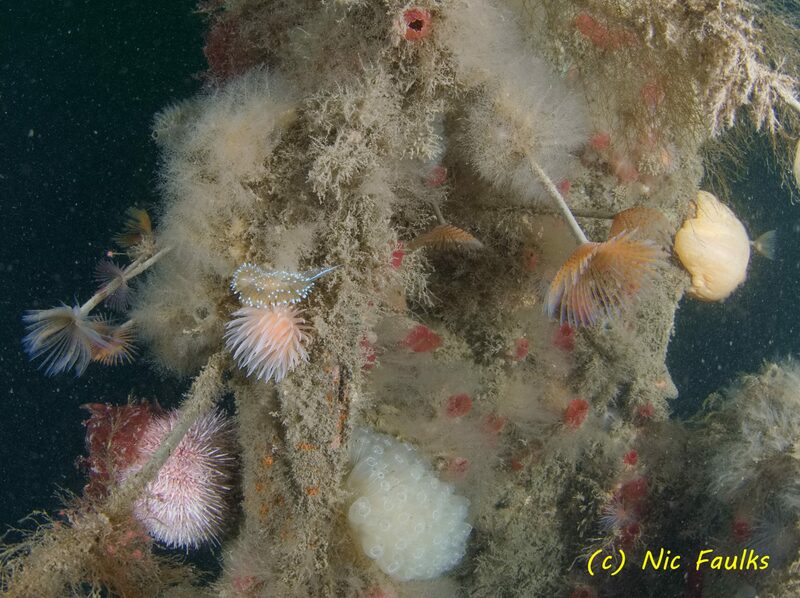 The wreck is mostly upright on the seabed, and plastered with life, plumose anemones and dead mans fingers. But the silt is easily kicked up…. as we found on returning to the shot. 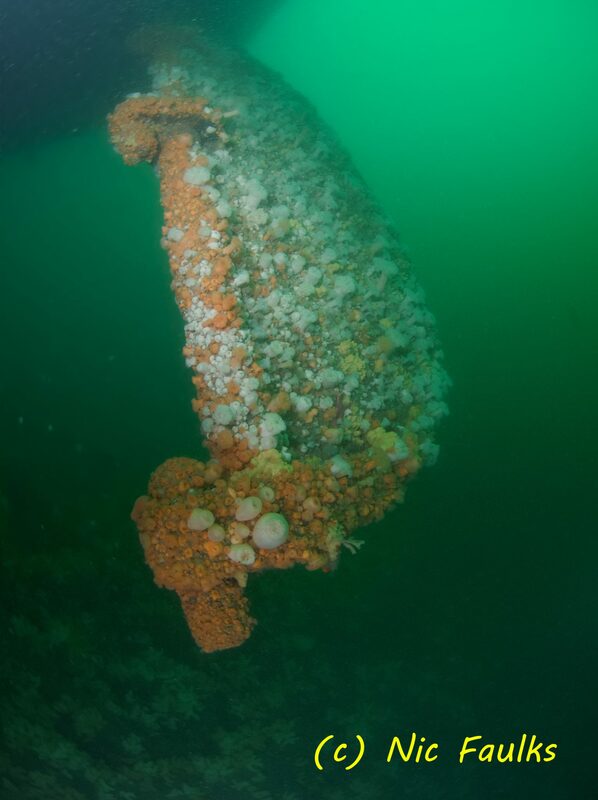 The stern is quite atmospheric, with no propeller, but the large rudder is still in place, indicating how big this ship once was. Everyone enjoyed the dive, the last in a series of enjoyable dives. So we headed back to the marina, to disembark, pack cars and head home. On reflection, diving out of Oban does mean slightly longer boat drive times to the wrecks in the sound, but for us as a group, it shortened the drive time to our accommodation by 2 hours (normally we stay in Lochaline). Oban also gave us a much greater choice of places to eat and things to do. On speaking to Lorne, it seams that there may be a wreck or two more that we haven’t dived that lie to the south of Oban, just out of the sound….. next year maybe?